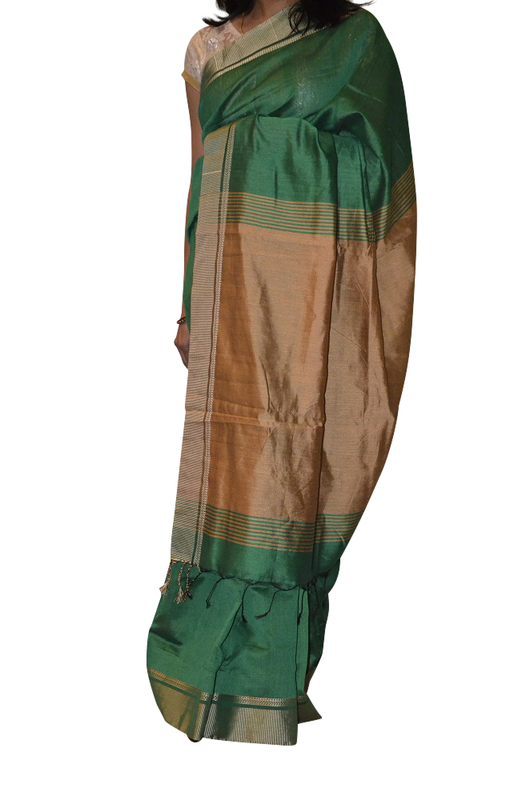 Very soft green pure light weight silk saree from Bengal with rich zari pallu. Crafted to perfection, this saree gives you one big reason to smile. The sari comes with matching Blouse piece. Occasion: Durga Puja, Diwali, Party or wedding. This item in Indian Sarees category was first added to our catalog on 10-27-2015. Buy Traditional Handloom Green Soft Silk Saree From Bengal, sold & shipped by Ahaarya where you can shop online for Latest Fashion Indian Dresses, Sarees, Salwar Kameez, Kurtis. This Sarees collection has been tagged as Party Dress, Women Clothing, Traditional Indian Wear, Silk Sarees, Bengali Saree.